The online shopping site Gilt employs a Principal Data Scientist, which is unsurprising and probably not that exciting, as far as titles go. However, he decided to find out if certain fashion choices vary by region or if women have certain universal preferences, which makes his job more mildly intriguing. And the result — pretty nifty graph documenting the average heel hight purchased by women in America and Puerto Rico — is quite interesting indeed. Kansas, Nebraska and Maine aren't exactly shattering expectations with their sensible 1.80-1.97 inch heels. I expected New York to be a bit higher—they average 2.09 inches—but that's probably just because I lived in Manhattan and watched scores of women teeter around the cobblestone streets of the Meatpacking District trying to avoid breaking their necks in five inch heels. Arkansas, rather weirdly, is on the high end of the spectrum, but I've never been, so what do I know? It is joined by Texas and Florida, (natch) who come in at 2.35 inches and 2.46 inches, respectively. However, it is Puerto Rico with the upset coming in at a 2.87 inch average heel height. Do with this info what you may, but remember to pack your least sensible heels during your next trip to San Juan if you're looking to fit in. 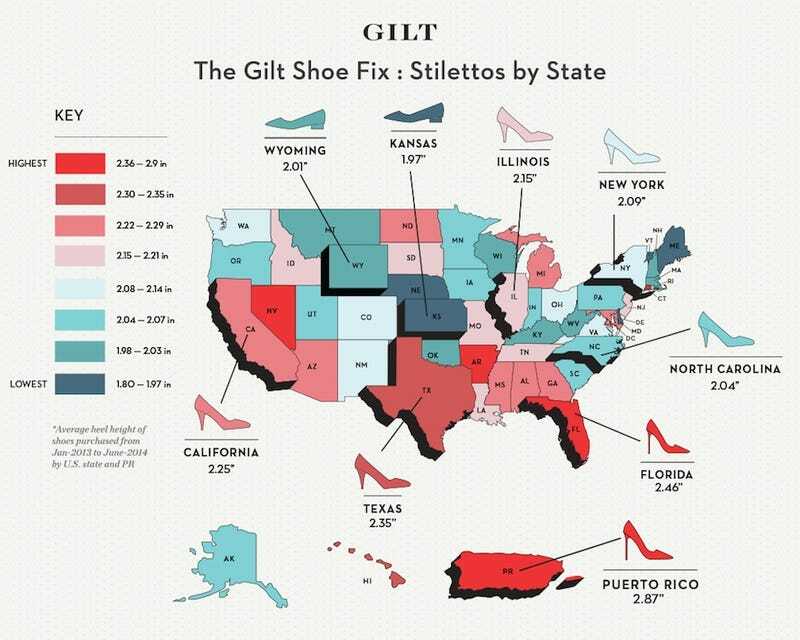 Map via Gilt. Used with permission.